Stems: Decumbent, branched at base; branches ascending, slender, 4-angled (square), inconspicuously hairy or nearly glabrous, often streaked with purple. Leaves: Opposite, simple, circular to egg-shaped, 1/5 to 3/5 inch long, usually as wide as long, 3-lobed or not, sometimes purplish in coloration, pubescent; margins with rounded teeth; tip blunt to rounded; lower leaf stalks to 1.4 inch long; upper leaves subtending flower clusters, sessile or clasping, 3/5 to 1 inch long. Inflorescences: Whorl-like clusters, few, generally well spaced, 3-6-flowered, in axils of bracts; bracts leaf-like, rarely 3-lobed, generally wider than long, sessile and clasping. Flowers: Calyx tubular, 1/5 to 1/3 inch long, 5-lobed, densely soft-hairy; lobes narrow, erect; corolla 2-lipped, 2/5 to 4/5 inch long, pinkish-purple, upper lip often darker, pubescent outside, glabrous inside; tube straight, 2/5 to 3/5 inch long; upper lip entire to slightly notched, 1/8 to 1/5 inch long; lower lip heart-shaped, to 1/10 inch long; stamens 4; small non-opening, self-pollinating flowers produced in fall, white-hairy. Fruits: Nutlets, 4, egg-shaped, 3-angled, smooth, tan to olive, each 1-seeded. Habitat: Waste areas, lawns, cropland, and roadsides; moist, fertile soils. Origin: Introduced from Europe and now naturalized. It is thought to have arrived in the United States via lawn seed during the 1920's. Uses: The seeds are consumed by some species of birds. Comments: This common weed can be problematic in lawns. 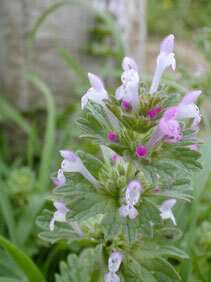 Henbit can grow under shrubs where grass will not. See related purple dead nettle, Lamium purpureum.